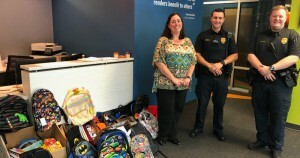 This July, YKK AP’s Heather Evans led the company headquarters and Atlanta branch’s team members in a joint effort to support the Cobb County Police Department’s school supply drive, Book Bag-Palooza. Thanks to this wonderful effort, Cobb County’s students in need – from elementary to high school – will be prepared and ready to learn this upcoming school year. Thank you to Cobb County Police Department and all of the community members who have contributed to this wonderful effort.